A surprisingly robust one-touch automatic. Priced in the mid-range, this model delivers tremendous value for the money. Recommended for: Easy enough for newbies to use, convenient enough for hobbyists, and even offering enough customization options to please some purists. A really nice machine. It’s a tougher question that’s tougher to answer than you might think. How much, on average, do you drink a day? How strong do you like your coffee? Do you prefer ease and convenience, or are you the type of person who values the ability to control most of the major decisions that go into making a great specialty drink? Wouldn’t it be awesome if there was a on​​​​e-touch coffee machine that could cater to all of those types of people? There is! While it’s true that the Jura C9 One Touch falls short of perfection, it comes awfully close, and we like it very much. Best of all, it’s priced in the mid-range, and yet, in many ways, can outperform even much more expensive models. In the sections that follow, we’ll outline everything this brilliant machine can do, and go over a few things it doesn’t do so well, so you’ve got all the information you need to decide if it’s a good fit for you. Even if you opt for a different model though, by the time you finish reading this review, we think you’ll agree. This is one of the machines that sets the standard that the rest get judged by. It’s simply a top contender. Let’s jump right in and see what makes this model tick! 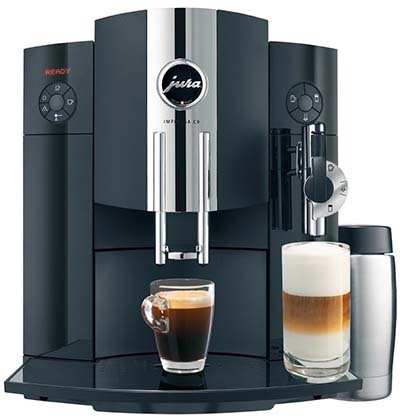 You can have the Jura Impressa C9 automatic coffee machine in any color you like, as long as it’s black. Apologies to Henry Ford, but it’s true. While many models come in multiple color schemes, the C9 is dressed all in black, constructed of sturdy ABS plastic, and features a few silver highlights. It has stainless steel where it needs it most (drip tray and boiler), but the use of plastic over much of the machine was one of the ways Jura was able to keep its price relatively low. The model measures 16” x 11” x 13.5,” and weighs in at 21 pounds, so even if you struggle to find a permanent home for it, it’s not much of a struggle to relocate it when you need to. This is a big deal from a feature standpoint, and our Jura Impressa C9 review wouldn’t be complete if we didn’t call particular attention to it. The C9’s tank is impressive, boasting a capacity of 64-ounces. It’s side-loading for easy access, and is designed to accept a water filter. We have a love-hate relationship with water filters, but we understand why the company includes them with so many of the models they make and sell. It’s convenient. It reduces the amount of maintenance you have to perform by virtually eliminating the need for descaling. Those are good things, but using a filter in the tank also has one significant downside. It increases the total cost of ownership of the machine because those filters are expensive! Add to that the fact that you can get around the need for descaling by using distilled water, and you can certainly see an argument for both sides. It comes down to personal preference, and what works best for you. If you opt to use the filter, here’s a tip that will save you some grief later on. You’ve got to go into the system settings menu and tell the machine you’re installing a filter. If you don’t, you’ll get a message to descale, even when you don’t need to. Jura has corrected this on some of their newer models, which auto-detect for the presence of the filter and update the setting for you, but on this model, you’ve got to do it manually. 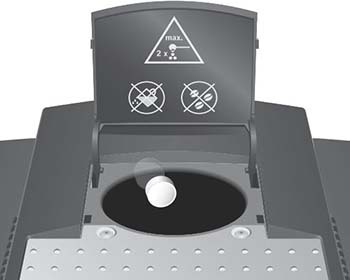 In our view, this is one of the weaker points in the Jura C9 Coffee Machine’s design. 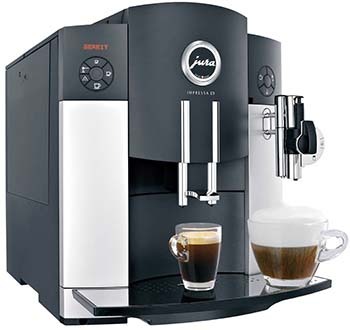 It utilizes a stainless steel conical burr grinder with six possible settings. The number of settings is about average, although you can find machines on the market with double, and sometimes even triple that number. The reason it matters is this: Finding the right grind setting is a vital piece of the puzzle when it comes to brewing a great cup of coffee. Experiment with this yourself, and you’ll see how big a difference it can make. The problem is, everyone’s tastes and preferences are different, and more settings allows you to dial into the exact flavor you want. Six just isn’t enough to give you the kind of flexibility we’re looking for, and although it should be fine for most casual coffee drinkers, purists are going to be decidedly underwhelmed. The more troubling problem is the fact that the grinders themselves are made of stainless steel. Ceramic grinders would have been better, because stainless steel heats up when used, which can burn your grounds and completely ruin the flavor of whatever drink you’re making. On the plus side though, the bean hopper that’s attached to the grinder has an 8-ounce capacity, which is well paired with the size of the water tank. The advantage there is that on some models, you see a mismatch, where a big water tank is paired with a tiny bean hopper or vice versa. When that happens, you’re left constantly scrambling to refill one or the other, which gets annoying fast. You don’t have to worry about that here, which is a very good thing. A final note about the grinders of super-automatics, in general, is the fact that they don’t do well with oily beans, which can clog your system, resulting in more frequent maintenance and if you’re not careful, it can burn out the grinder’s motor. For best results, find a nice Medium Roast you like and stick with that. If you’re not in the mood for the whole experience, the C9 also features a two-scoop bypass doser, which is a nice touch, and handy if you want a cup of late-night decaf or something. The Jura Impressa C9 uses a single aluminum boiler, lined with stainless steel and featuring Thermoblock technology for rapid heating. You can find systems that offer a double boiler, which gives you the advantage of being able to simultaneously steam milk and brew coffee, but you’ll pay a premium for the privilege, and honestly, the second boiler doesn’t save you all that much time. Sure, you have to wait while the boiler shifts gears, but that time is measured in seconds, rather than minutes, and generally isn’t a deal breaker for anyone. There are some things we like about this feature’s implementation on the Jura Impressa C9 One Touch, and some things we don’t. The weakness, in our view, is that even at maximum height, the coffee spouts will only accommodate a maximum cup size of 4.25.” We’re power drinkers, and usually, have bigger cups than that, but it should be more than adequate for most users. On the plus side though, the way the C9 is designed, you don’t have to move your cup when making a milk-based drink, because the milk spigot has a coffee spigot built just behind it, so when you’re making a café latte or similar drink, you simply set the cup up on the milk side of the machine and go. That’s a nice touch and good design. 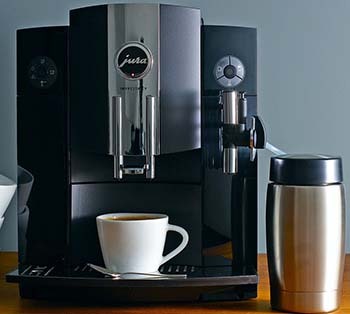 This is the heart and soul of any semi- or super-automatic coffee machine, and as such, is a critical component of our Jura Impressa C9 review. The brew units on Jura machines aren’t removable, so you’ve got to use a cleansing tab to give it a good cleaning about once a week. Do that, and it will keep making coffee magic happen for you on demand. The control unit is simplistic, using old school LED technology, but despite the inherent limitations of that, it’s surprisingly easy to use. It features a relatively simple menu system allowing you to change the default language of the machine, reset to factory defaults, change your drink settings, set the auto-shutoff time, perform routine maintenance, and the like. You can customize any of these to taste, changing the strength of each drink (mild, normal, or strong), the amount of water and/or milk used, and the temperature (low or high). American coffee drinkers will probably just want to set the temperature for all drinks to high and leave it because we tend to like our coffee hotter than Europeans drink theirs. Saying that brings us to a few interesting points, however. If you’re new to the world of specialty coffee drinks, you should know that they were meant to be enjoyed at temperatures less than what the drip-brew coffee machine you’re used to. Setting the temperature to high goes quite a way toward solving this problem, but it doesn’t completely close the distance. The problem gets worse if you’re making a milk-based drink, because milk has to be steamed at a lower temperature, lest it ruin the flavor, and of course, when you mix your milk and coffee, you lose more heat. If you dispense your drink into a cold cup, you lose even more. It is for this reason that you’ll want to make regular use of the cup warming tray built into the Jura Impressa C9 coffee maker. If you pre-warm your cup, you minimize heat loss. That, combined with setting your temperature to high will get you close to the temperature result you’re looking for. This is a good time to say a few words about the brewing differences between espresso and drip-brewed coffee. The drip-brew machine you’re accustomed to uses gravity to convey the water from the brewing chamber to your waiting cup or pot. 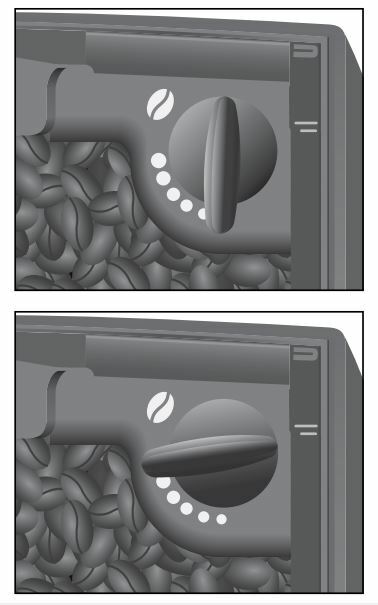 Espresso machines rely on pressure, which is measured in bars. One bar of pressure is equal to atmospheric pressure at sea level. It takes at least 9 bars of pressure to make a good espresso, and the C9’s pump is rated at 18 bars, so you won’t have any trouble getting a great shot of espresso from the unit. 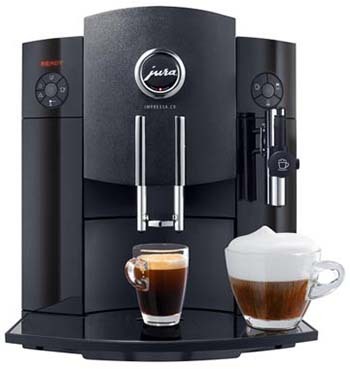 That matters a great deal, because espresso is the foundation of a whole host of specialty coffee drinks, so if you can make a consistently good shot, you can have pretty much any drink you desire, and the Jura Impressa C9 One Touch coffee machine delivers. The other crucial ingredient in a lot of specialty coffee drinks is milk, which brings us to our next section. We were a bit skeptical about the milk frothing system at first, but having seen it action, we heartily approve. 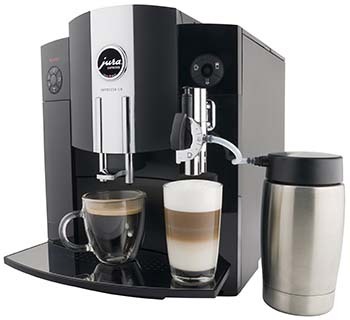 To start with, the Jura Impressa C9 coffee machine utilizes an auto-frother, rather than a steaming wand, and comes with a stainless-steel carafe and three different plastic hoses of varying length. One end of the hose is plugged into the milk carafe (which can keep your milk cool for up to eight hours), and the other into the milk spigot of the unit. When you order a milk-based drink from the menu, milk is siphoned out of the carafe, into the boiler where it’s heated, and then dispensed as a combination of steamed milk and foam. There’s a control lever on the milk spigot that allows you to regulate the amount of foam and the heat of the milk. While this doesn’t allow for quite as much control as a frothing wand, it comes pretty close, and delivers consistently good results. On the other hand, if you absolutely must have a wand, you can do that too, though you’ll have to buy it separately. This is possible because the C9 utilizes a patented connector system that allows you to swap out the factory standard for some other, including a proper steaming wand, so there you go! We talked about this in the last section, and why it’s important, but we did want to mention again that yes, the C9 has one, and you should make regular use of it! We mentioned earlier that the C9’s navigation system was easy to use, so this section will mostly be about cleaning, and this is another area where the model shines. In fact, one of the more common complaints you read from users is that it might spend too much time cleaning! When you first power the machine on, it runs through a quick rinse cycle ​​​​to make sure it’s ready to go. After each milk drink, it does another. When you shut the machine down for the day, it cleans itself again. Of course, there are several bits of manual maintenance you still need to attend to. You’ll get a friendly reminder when it’s time to give the brew unit a good scrub with one of your cleansing tablets. If you’re not using a filter, there will be the occasional descaling routine to do, then of course the drip tray and dregs box need to be emptied periodically, but all of these components are easily accessed, and will present no problems in terms of keeping them clean and ready for use. There’s honestly not too much we don’t like about this machine. With its generously sized water tank and bean hopper, it can keep pace with even the most rabid coffee fanatic, and best of all, the C9 makes really strong shots, using more grams of beans on its strongest shot setting than most other models. That said, our Jura Impressa C9 One Touch review would be lacking if we didn’t call out what we felt were the machine’s shortcomings, or things that could be more strongly implemented. On this front, our main quibble is with the grinder. Stainless steel is just a suboptimal choice for this machine and doesn’t do the rest of the design justice. We’d love to see ceramic burrs and more settings. Apart from that, an updated display with an LCD or TFT (Thin Film Transistor) screen and maybe user profiles would be nice, but both of these things would add significantly to the cost of the machine. While neither of these are deal breakers, it is important that you have a complete picture of what you’re getting before you buy. 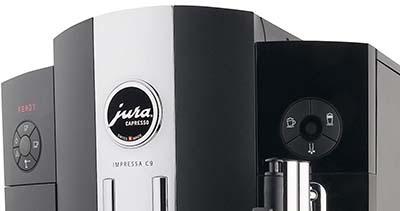 So that’s our Jura Impressa C9 review. We love it, and we’re pretty sure you will too. It’s easy enough to use that even someone who’s not tech savvy can figure it out in no time, offers the convenience of one-touch functionality for people who don’t want to train to become a Barista, but still want the coffee shop experience at home, and it offers enough flexibility (if you buy a frothing wand to replace the auto-frother) that even most purists will enjoy using it. So far, we haven’t given out a perfect five-star rating to any machine, and the C9 only narrowly missed getting one from us. It’s that good, and in our opinion, punches well above its weight class, often outperforming machines that cost twice as much, or more. Highly recommended. How Water Filtration Affects Automatic Espresso Machines. Espresso Partners. Why Every Office Needs A Coffee Machine. Talkbusiness Magazine. The Advantages of Having a Coffeemaker At Home. Economics and the Commons.